The cell factory: James Thomson (above) and Junying Yu first transformed adult cells into stem cells called iPS cells in 2007. The small plastic vial in James ­Thomson’s hand contains more than 1.5 billion carefully coddled heart cells grown at Cellular Dynamics, a startup based in Madison, WI. They are derived from a new type of stem cell that ­Thomson, a cofounder of the company, hopes will improve our models of human diseases and transform the way drugs are developed and tested. 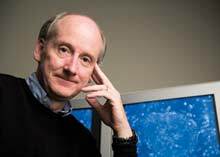 Thomson, director of regenerative biology at the Morgridge Institute at the University of Wisconsin, first isolated human embryonic stem cells in 1998. Isolating these cells, which are capable of maturing into any other type of cell, marked a landmark in biology–but a controversial one, since the process destroys a human embryo. A decade later, ­Thomson and Junying Yu, then a Wisconsin postdoc, reached another milestone: they developed a way to make stem cells from adult cells by adding just four genes that are normally active only in embryos. (Japanese researcher Shinya Yamanaka simultaneously published a similar approach.) Dubbed induced pluripotent stem cells (iPS cells), they have the two defining characteristics of embryonic stem cells: they can reproduce themselves many times over, and they can develop into any cell type in the human body. Because no human embryos are used to create them, iPS cells solve two problems that had long plagued researchers: political protest and shortages of material. Much of the excitement over iPS cells, and stem cells in general, arises from the possibility that they could replace damaged or diseased tissue. But Thomson thinks their most important contribution will be to provide an unprecedented window on human development and disease. Scientists can create stem cells from the adult cells of people with different disorders, such as diabetes, and induce them to differentiate into the types of cells damaged by the disease. This could allow researchers to watch the disease as it unfolds and trace the molecular processes that have gone awry. In the nearer term, iPS cells may revolutionize toxicity testing for drugs. The cells are “the first unlimited source of any type of human tissue,” says Thomson, who founded Cellular Dynamics to put stem cells to practical use. The company sells heart muscle cells derived from its iPS cells to pharmaceutical giants such as Roche, which are using them to screen experimental drugs for harmful side effects. Thomson hopes those cells will help uncover problems early in the drug development process, saving billions of dollars on research and testing. For instance, since the iPS-derived heart cells will beat in a dish, scientists should be able to detect which drugs alter the heart’s rhythm. Scientists can also use the cells to study how the heart functions at a molecular level. And the company is developing other cell types, including brain and liver cells. The latter are of particular interest to pharmaceutical researchers, since drug toxicity often shows up in the liver. “Having a model that would predict toxicity before going into humans is incredibly valuable,” says Chris Parker, vice president and chief commercial officer of Cellular Dynamics. By generating iPS cells from people with diverse ethnic backgrounds and genetic conditions, and from those who have reacted poorly to certain drugs, scientists can also gain a better picture of how compounds will affect different people. Thomson and others have already created iPS cells from people with ALS, Down syndrome, and spinal muscular atrophy, among other disorders. While it’s not yet clear how well those cells reflect the specific diseases, early research is promising. If it succeeds, researchers hope to use iPS cells to study other disorders and develop drugs to treat them. “That’s the thing that would fundamentally change the way drug development happens,” says Kyle Kolaja, director of early safety and investigative toxicology at Roche, which has partnered with Cellular Dynamics.